The three main party leaders have agreed to take part in digital debates on websites Facebook and YouTube. Internet users will be able to suggest questions in five categories on the sites, which will be voted on by other members of the public. Gordon Brown, Nick Clegg and David Cameron have pledged to post video responses 10 days before election day. The leaders will take part in three live television debates in the run-up to this election, in a historic first. Internet users can post questions in text or video form, in the categories of economy, health and education, law and order, foreign policy and miscellaneous. Users are not allowed to post any offensive questions, and all three leaders will answer the two most popular questions in each category. Peter Barron, director of communications for Google, YouTube's owner, said: "Although the televised debates will be a historic first, we feel that that there is an opportunity for a different type of platform that allows voters to be in charge of the questions. "By collaborating with Facebook to put together one initiative we hope to enable as many voters as possible from across the UK to take part." 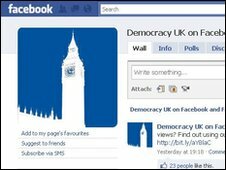 Richard Allan, Facebook's Director of Policy, said: "The dawn of the digital election this year is a transformative moment for democracy in Britain. By allowing voters to cross-examine their leaders, these digital debates will put the voters firmly in charge. "This marks a decisive shift away from the constraints of top-down traditional media and will take full advantage of unique scale and reach of Facebook, thus changing the way that politicians campaign for good."